Do I need an appointment to try on wedding dresses at Kleinfeld? Yes, In order to give you the full attention of our experienced consultants, appointments are necessary. We suggest you book your appointment 2-3 weeks prior, however, feel free to call 212.570.0433 for same-day appointment availability. Click here to book an appointment online. Alternatively, you can call Customer Service at +1 (646) 633-4300 or send an email to info@kleinfeldbridal.com. Dress appointments are 2 hours long on week days and 1.5 hours on weekends. Accessories-only appointments are 1 hour. Yes! But, please call 48 hrs ahead of time at +1 (646) 633-4300. If you need to cancel the same day, please call +1 (646) 633-4333. You may walk-in at any time that we’re open to try on shoes and jewelry. Appointments are required to try-on veils and headpieces. Same day appointments may be available. Call +1 (646) 633-4333. Click here for store hours. Absolutely! Not only can you find a dress on your first visit to Kleinfeld, but you can also find all of your bridal accessories, including your veil or headpiece, shoes, jewelry, and more! Why do you take my credit card to make an appointment? Kleinfeld requires a credit card to reserve your appointment. There is no charge for the appointment. However, if you do not cancel 48 hrs prior to your appointment, you will be charged a $100 cancellation fee. How do I make sure a dress I love from the website is at Kleinfeld for my appointment? You may call to reserve a specific dress at +1 (646) 633-4300. You must book an appointment in order to reserve a dress. What if I don’t say YES to the dress at my first appointment? How do I make another appointment? If you didn’t fall in love with a dress at your first appointment, you will be able to work with your consultant to book a return appointment. You can schedule it with our receptionist before you leave or call +1 (646) 633-4300 when you are ready to book your next appointment. Be sure to bring the following 5 things to your Kleinfeld appointment: budget parameters, pictures of dresses, bridal accessories and shoes (if you already have them), proper undergarments (remember, you’ll be changing in front of a stranger; if you plan on wearing spanks or a strapless bra, please bring them) and most importantly, an open mind! Don’t be surprised if you find “the dress” on your first visit to Kleinfeld. Bring the closest friend or family member whose opinion you value and who knows you well and with whom you want to share the experience of buying your dress. Bringing more than 5 guests can take the focus off of you. Do I get to choose my consultant? We are always happy to accommodate you if you have a consultant request, otherwise you will be assigned a consultant the moment you arrive for your appointment. If you need a consultant who speaks a particular language, do not hesitate to ask. What if I’m not happy with my consultant? We want your experience in our store to be as memorable as your wedding day. If you find that you are not bonding with your consultant, please ask to speak to a manager or to owners, Ronnie & Mara, right away. We’ll make arrangements for you to work with someone else to make sure you have an enjoyable experience! Yes, we encourage pictures! Don’t forget to use #Kleinfeld if you choose to share! Which designers can I find only at Kleinfeld? We have a number of designers who are exclusive to Kleinfeld, including Pnina Tornai, Tony Ward, and Dennis Basso. Check out the full list of Kleinfeld Exclusive Designers. What are the price ranges for dresses at Kleinfeld? Kleinfeld’s special-order designer dresses start at $2000, with a very limited designer selection from $1500 to $1700. Off-the-rack samples can be much less, discounted up to 70% off and typically start at $899. You can shop for sample dresses at The Kleinfeld Sample Studio located across the street. What dress sizes are available to try-on at Kleinfeld? Most of our sample dresses are a size 10. Please note that a bridal size 10 is equivalent to a street size 6. Our consultants are experts at clipping and pinning to ensure a great fit. We also carry the largest selection of designer plus-sized samples in size 18-32. Click <here> to view Kleinfeld’s selection of plus-sized gowns. When do I start shopping for a wedding dress? It’s best to allow 8-10 months before your wedding to order a dress. That means you’ll want to start shopping at least a year in advance. How often do you get new dresses? Kleinfeld shops the world to find dresses from the best designers. From Italy to Israel, Spain to London and more, our buyers find the best dresses worth seeing. Every day Kleinfeld receives new dresses from international designers. If you are looking to shop domestic designers, they typically release new collections in April and October. Check out our Trunk Show Calendar to find your favorite new collections or click here to see new dresses. What is a special-order dress? Most of the dresses sold by Kleinfeld are special-order. A special-order dress is made specifically for you by a designer, based on the measurements we take from you, the designer then uses their pattern that is closest to your measurements to create your dress. Then during the alterations process we will fit it to your body perfectly. How do you determine which size I will order? Once you’ve chosen your dress, a Bridal Manager takes 3 or more measurements typically, bust, waist, and hips. The dress is ordered from the designer according to your largest measurement, enabling your seamstress to alter the dress at your fitting appointments. Can I order extra fabric and/or swatches of my gown? We will be happy to take a small sample from your actual dress when it arrives from the designer. Since dye lots vary widely, this will give you the best color to use for matching. Can I customize my wedding dress? Example: Add sleeves? Depending on the designer, customizations are available for an additional fee. When should I start shopping for accessories? Special-order designer veils and headpieces have a 3-4 month lead-time, so making a decision at the time you order your dress is advised. At your first fitting, you can order a Kleinfeld custom veil which we’ll make for you on premise. 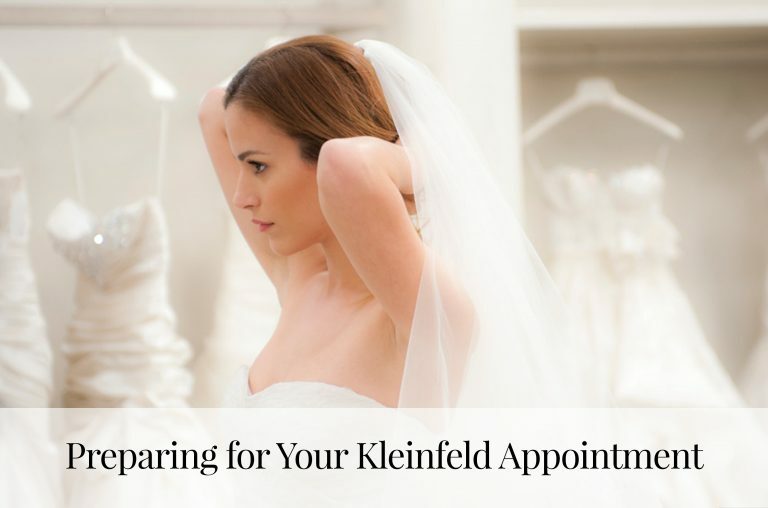 If you have a shorter time frame, visit the Kleinfeld Sample Studio for off-the-rack sample veils and accessories. Do I need an appointment to look at accessories? You may walk in at any time to try on shoes and jewelry on Tuesday, Thursday, Friday or Saturday. Appointments are required on Sundays. Appointments are required for all veils and headpieces any day of the week. Click here for Store Hours and Call +1 (646) 633-4300 for appointments. How long is an accessories appointment? Accessories-only (Veils, Bolero’s, Headpieces) appointments are 1 hour long. Do I get a consultant for my accessories appointment? Yes, you will work one-on-one with a Kleinfeld Accessory Stylist. I didn’t purchase a Kleinfeld dress. Can I still buy accessories from Kleinfeld? Yes. Feel free to bring a swatch or photo of your dress and we will help you find the perfect accessory. HELP! I’m getting married less than 4 months – is it too late to get a gown from Kleinfeld? No, it’s not too late, but every second counts! Your options include buying one of our samples off the rack or working with a consultant to determine which designers can meet your time frame for a “special order” gown, which could include an additional rush charge. If your wedding date is sooner than the time we typically need to have a special-order designer gown made, we’ll need to consult with the designer and place a “rush” order, for an additional fee. In this instance, your dress may arrive 1-3 weeks before your wedding and details will be outlined in your contract. How much will a rush order cost? A rush fee varies by designer, style and wedding date. What else do I need to know about rush orders? We advise having a flexible schedule to accommodate rush alterations. When will I know to schedule my first fitting? You’ll receive an email or text message from Kleinfeld when we receive your wedding dress from the designer. At that time, you must pay the balance and schedule your first fitting. Generally, that will be about 8-12 weeks before your wedding day but can vary depending on designer and dress arrival. You should bring the shoes and undergarments you’ll wear on your wedding day in order to have your dress properly fitted through the bodice and hemline. If you don’t have your shoes, plan to arrive at least 30 minutes before your first fitting appointment to shop our shoe department. If you have not paid your balance, you must see a Financial Services Representative before you leave. Kleinfeld will not start altering your dress until it is paid in full. 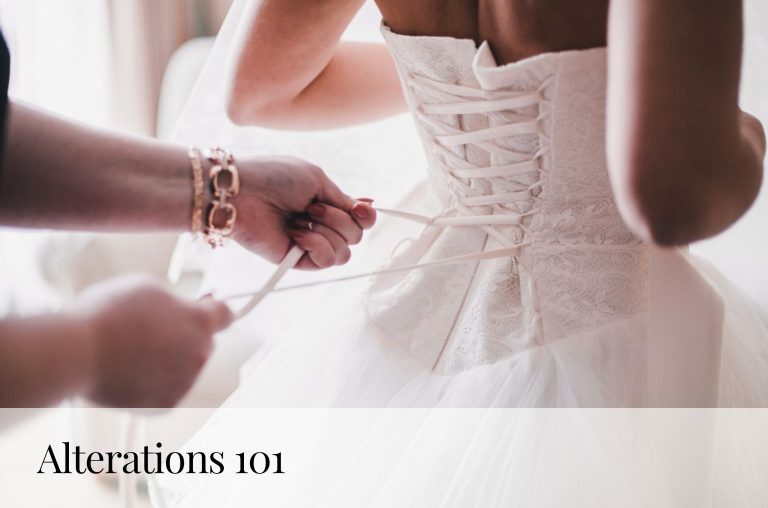 Typically, brides require 3 fittings to ensure the proper fit. After the final fitting, we’ll press and pack your gown for you to take home or for shipping. We accept American Express, Discover, MasterCard, and Visa, as well as cash and personal checks. (Personal checks are only accepted for deposit, not final payment.) If you are ordering a special-order dress, we require a 60% deposit at the time you order your dress. When the dress arrives at Kleinfeld and passes our quality control check, we’ll contact you to let you know and to schedule a fitting. At that point, we require payment of the remaining 40% balance. If you are buying a sample gown off the rack, we require 100% payment and you must take the dress home with you that day. If you’ve requested that we ship your gown out of state, your balance must be paid for in full before it can be shipped. Do I have to pay for my dress in full? Kleinfeld requires a 60% deposit on your dress and any customizations at the time you place the order. Will I pay sales tax on my dress? NY State sales tax applies to all Kleinfeld merchandise. Kleinfeld will extend 10% off* with a military ID of you or your fiancé. *Some designers restrict us from offering discounts. Will you ship my dress out of state for me? We can ship a dress within the US and participating countries outside the United States. Shipping fees apply. How much does it cost to ship my dress? The cost to ship your dress depends on your address. The fee typically starts at $125 and up. To inquire about shipping costs please call +1 (646) 633-4300. Fedex, but occasionally we will ship DHL for international orders. How will I know when my dress has been shipped out? You will receive an email from the shipping provider with a tracking number. Fed-ex will email you your tracking number. How does the dress arrive? The dress will arrive in a large box! We insist that you do not open the box until you get to Kleinfeld for your first fitting appointment. The dress will arrive pressed and packed in a large box! We recommend opening the package and taking your dress out to let it hang in a safe place the night before your wedding. What do I do when I receive my dress? See above. Depends if you are returning for fittings or if you are shipping after final alterations. What about International shipping customs and duties? All customs and duties from your package will need to be paid for before delivery. How much do you charge to preserve my wedding gown? The price of preservation ranges from $595 – $895, depending on the style and detailing of your gown. Due to the complex construction, there is an additional charge for Pnina Tornai gowns. Please call +1 (888) 850-2008 1-888-850-2008 – for your price quote. After you make arrangements with a Kleinfeld gown preservation specialist, your gown can be dropped off at Kleinfeld 110 West 20th Street or we can schedule a pick up on Saturdays in the New York City area for buildings with doormen. If you live outside New York City, we can arrange for your gown to be packaged and shipped to us via a UPS Store that is convenient to you. Your Kleinfeld gown preservation specialist will be happy to assist you in making these arrangements. When should I send my gown to you? As soon after the wedding as possible, as stains cause damage to fabric over time. After the wedding, do not put your gown on a hanger or in a plastic bag. Keep it in a dark, dry place, folded or rolled in a clean white sheet. Hanging is not recommended as it can cause stress to the fabric and create distortion. Do not store your gown in a plastic garment bag because it may yellow the fabric. How will my dress be stored after preservation? We preserve your gown in a completely archival textile storage box made of fluted polypropylene. A chemically co-inert polymer, this material is non-absorbent, provides more complete moisture protection, than a cardboard box and resists fluctuations in temperature and humidity. Our proprietary boxes are made of the same material as those used by The Costume Institute at the Metropolitan Museum of Art in New York to store historic costumes. Can I look at my gown after it is preserved? Absolutely. In fact, we encourage you to open the box and inspect your gown regularly. Remember that your skin contains oils and salts that can damage delicate fabrics. It is important that you wash and dry your hands carefully before handling your gown. When you remove the gown, slide both hands under the whole gown and lift it out of the box. As you unfold the gown, note the way we packed it so you can re-fold it properly. Where should I store my wedding gown after it is preserved? Choose a storage place within your living quarters, without much traffic; however we do not suggest storing your gown in an attic or a cellar. Store the box flat, with the lid side facing up. When you move the box, carry it so that it is as level as possible. We have packed your gown so that it will not shift under normal circumstances, but flat storage will ensure this remains true. Our special preservation storage materials were chosen to protect your dress from exposure to moisture, fire, dust, acidity and light. Sample dresses are the designer wedding dresses that our buyers have purchased for you to try on in-store at Kleinfeld. A sample dress is one that has been tried-on before; but is typically in excellent condition. Cancelled orders that may be in perfect condition may also be at a sample sale or available at the Kleinfeld Sample Studio located across the street at 123 West 20th Street, NYC. What dresses are featured at a Sample Sale? A typical Kleinfeld sample sale features over 600 designer sample dresses in sample size 10 thru 32 as well as designer sample veils, headpieces and accessories. A sample sale generally features over 60 designers including but not limited to; Alita Graham, Amsale, Dennis Basso, Hayley Paige, Jim Hjelm, Lanvin, Lazaro, Legends by Romona Keveza, Maggie Sottero, Madison James, Mark Zunino, Peter Langner, Pnina Tornai, Reem Acra, Rivini, Tara Keely, Tony Ward, Watters, Yolan Chris, Zuhair Murad and many more! Sample accessories include headpieces, tiaras, veils, shoes, jewelry, purses and belts. The same deal with dresses — sample accessories have been purchased by buyers to always be available for try-on at Kleinfeld. In order to make room in inventory for new products, we sell the floor samples that have been tried-on before. Anything purchased at a sample sale will be final sale. The full amount + applicable sales tax is due at the time of purchase. Kleinfeld will accept cash or credit card. No. All Sample Dress or Accessory purchases made at the sale or the Kleinfeld Sample Studio are cash/credit and you will leave with that dress the same day. Yes! For Kleinfeld Sample Sales, you must purchase a ticket or book an appointment time in order to attend. Sign up for emails to be the first to know about an upcoming Sample Sale event. A trunk show is a in-store designer event which features a particular designer collection. The trunk show typically lasts one to three days, where you can view and buy from a designer’s latest collection months before the full collection hits the stores. The designer and or their representatives are usually at the store during a trunk show. If you find the dress of your dreams at a trunk show, be prepared to make a decision that day, as the gown will not be in the store once the trunk show is over. Kleinfeld typically hosts two designer trunk shows per week. Click here to view our 2017 Trunk Show Calendar! Do I need an appointment to attend a trunk show? Yes, you will need an appointment to shop for dresses during a designer trunk show. Who can I bring to a trunk show? 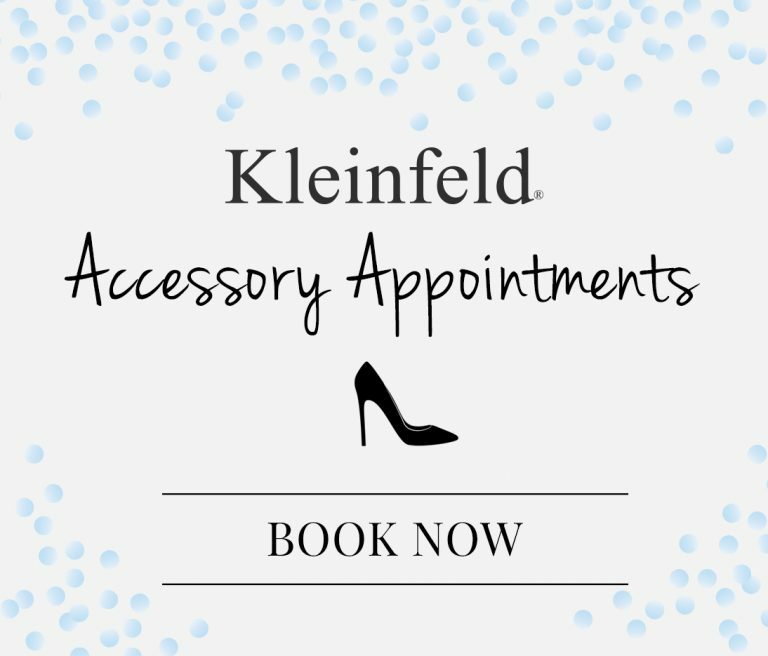 Kleinfeld allows up to 5 guests at any appointment. Are the dresses less expensive at a trunk show? No but sometimes designers will offer a special discount such as a discount or complimentary sketch. Are there Accessories Trunk Shows as well? Yes, click here to view our accessory trunk show calendar. Do I get to meet the designer at a trunk show? Sometimes! Depending on the designer collection, the designer his/herself, may attend. When is the next trunk show at Kleinfeld? Check out our 2017 Trunk Show Calendar to see the upcoming shows! How often does Kleinfeld host trunk shows? Kleinfeld hosts more than 50 trunk shows every year! How do I apply to be on Say Yes To The Dress? Say Yes To The Dress has a show application here. I saw a dress on the show that I love. How do I find it at Kleinfeld? If you find a dress you love on the show – check out our Featured Show Gowns here. I am a fan of the store —can I come visit? Yes, we always welcome fans. We will allow you to stop in for a photo but we ask that you refrain from disrupting our real brides-to-be shopping in the main salon. You can also visit the lower level to shop jewelry and accessories. I’m not getting married but I love the show and would like to come and try dresses on? Can I do this? Unfortunately, we are unable to accommodate fans to try on dresses due to the high volume of brides-to-be. I have an appointment, but I don’t want to be on the show. No problem! TLC does not film every day. The Kleinfeld Experience isn’t just about the show, Say Yes To The Dress. There are hundreds of appointments that aren’t shown on the show, but are just as important and exciting! If we are filming during your appointment, alert your sales consultant and they will keep you away from the cameras. I’ve applied to be on the show but I haven’t heard back yet. How do I find out my application status? Typically, if you’ve been picked to be on the show, you’ll hear back within 2-4 weeks. Can I have Shay as my consultant? Yes, you can always call customer service +1 (646) 633-4300 to request a consultant, but it’s based on the consultant’s schedule and not always guaranteed! Where do I watch older episodes? On Kleinfeld’s website under “The Show” you’ll see “Videos” where you can watch little snippets from each season. To watch all 15 seasons, visit TLC.com. Will my experience be videotaped? Although we wish we could film all of our brides saying yes, unless you are featured on the show, your experience will not be videotaped. Will my experience be like the TV show? Whether on TV or not, over 250 Kleinfeld employees work to make every bride that walks through the door feel like she is the only bride. Kleinfeld’s co-owners, Ronnie and Mara, run this business like a family. This is what the “Kleinfeld Experience” is all about. Kleinfeld is passionate about making sure your dress experience is infused with kindness, positivity, confidence, and the recognition every bride deserves. Will Randy be at Kleinfeld during my appointment? Randy is currently traveling around the world showcasing his newest collection. He may be at Kleinfeld during his trunk shows or when he is filming an episode of Say Yes to the Dress.